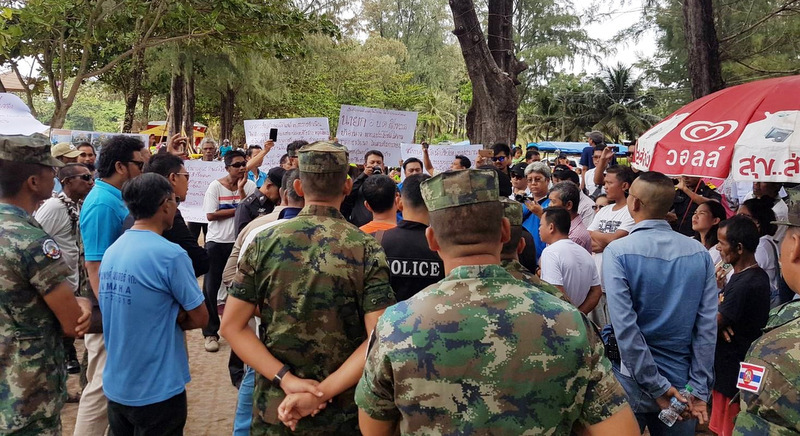 PHUKET: More than 100 disgruntled local residents and beach operators massed at Surin Beach this morning (Nov 27) to present a list of demands in the hopes of clearing up “misunderstandings” about alleged duplicity in allowing beach operators to serve tourists on the sands and to raise the standard of the beach so that it becomes more attractive to tourists. The list was to be presented to MaAnn Samran, chief of the Cherng Talay Tambon Administration Organisation (OrBorTor). 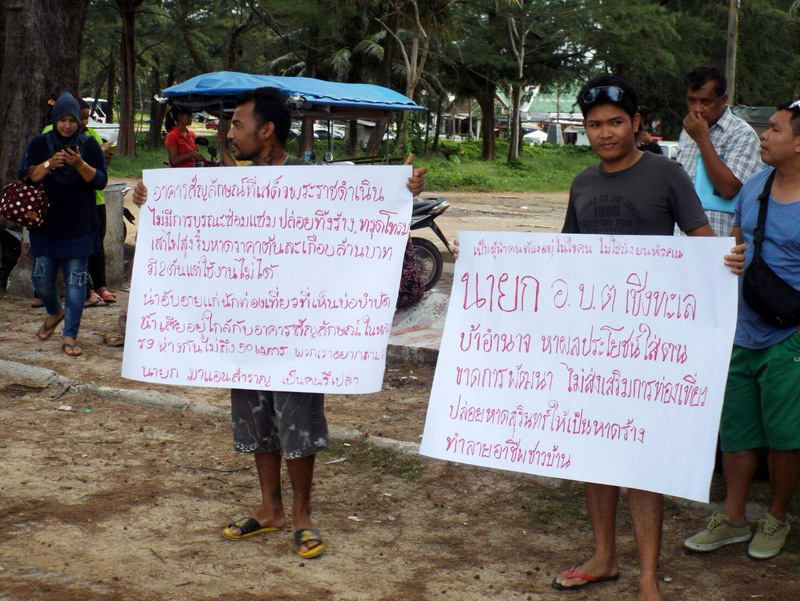 However, despite arranging to meet the residents at Surin Beach this morning, Mr MaAnn was nowhere to be found. 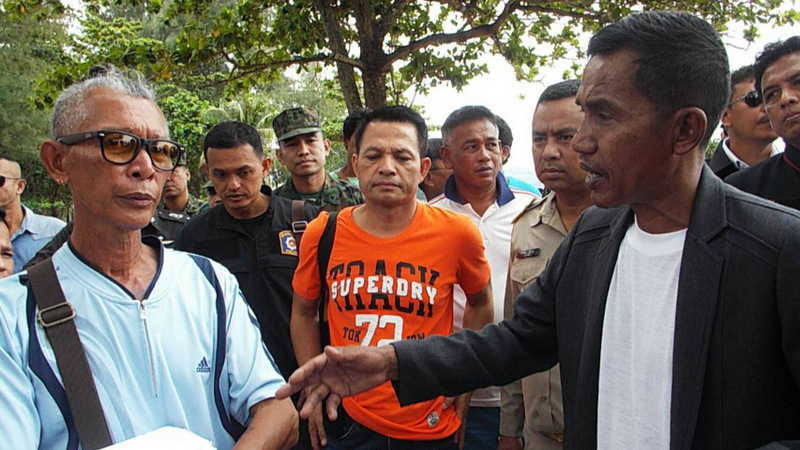 “We contacted Mr MaAnn this morning and he said he was unavailable to meet us as he was at Phuket Provincial Court,” local resident Jamlong Sitthichock told Khao Phuket, The Phuket News’ Thai-language sister newspaper. One key concern raised this morning is why massage services were still allowed to be provided on the beach while all other operators, notably restaurants, were forced to vacate their sites on the sand. 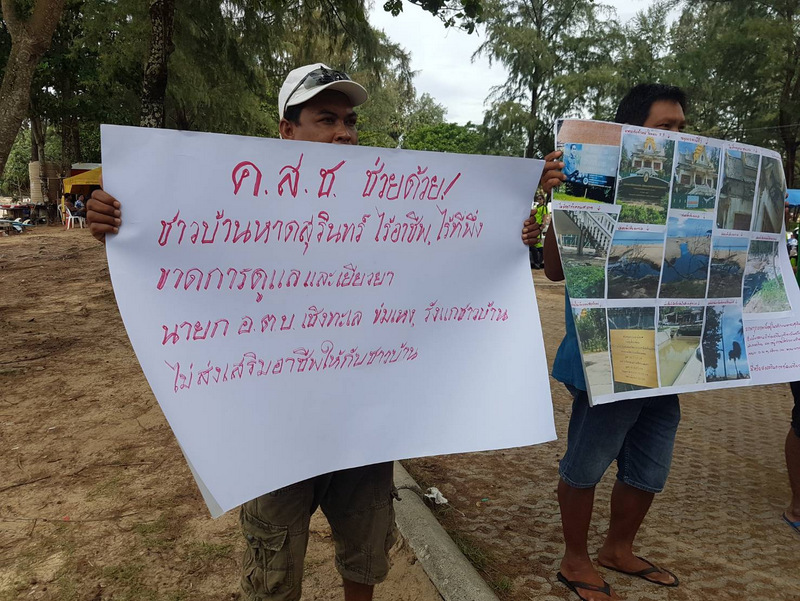 “We believe that the notice to stop beach operators on the beach was issued after local residents forced the construction of the Surin Beach seawall to halt on Nov 15,” said Mr Jamlong. However, when challenged on this point, Mr MaAnn was unable to prove any such meeting took place, alleged Mr Jamlong. “We have doubts about many issues about the construction, including that Mr MaAan told us that a public hearing had been held, but when we asked to see any evidence of this, he was unable to provide it,” Mr Jamlong said. Fellow local resident Pradab Koliyon noted, “There are many issues that we have to discuss with officials. Mr MaAan Samran allows beach Thai massage operators on the beach, but does not allow permanent beds and umbrellas. “When soldiers inspected the beach they asked why there are still Thai massage operators there. So we have to talk with Mr MaAan about this issue.” he said. Lt Col Surasak Phuengyam, Deputy Commander of the Royal Thai Army’s 25th Infantry Regiment, which is based in Phuket, explained at Surin Beach this morning, “Normally we do not allow any business on the beach, but we have compromised for them to remain temporarily along the beach road while the municipality was finds a new place for local beach vendors to operate from. “We did not ignore them or bully them. I have no idea what Mr MaAan has agreed with them,” he added. Regardless, the list of demands presented this morning ranged issues far beyond beach vendors on the sand. It also called for the Phuket Governor, the Thalang District Chief, officials from the Cherng Talay OrBorTor and even the Deputy-General of the Land Department to meet to resolve the issues. 2. 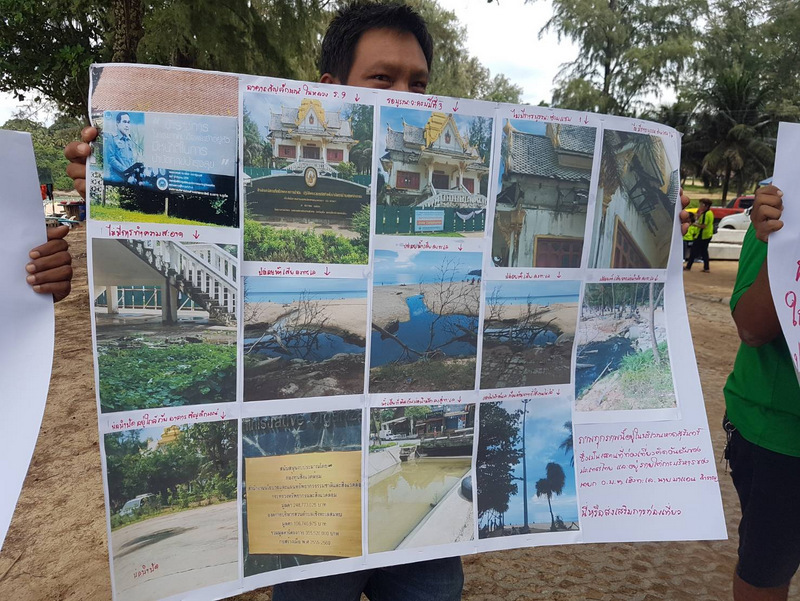 The National Council for Peace and Order (NCPO) is cited as the reason for the beach management, but then local shops are demolished. Is this right? 6. The Cherng Talay OrBorTor Chief must provide at least two public toilets for tourists, and local residents who exercise at the beach, to use. 9. 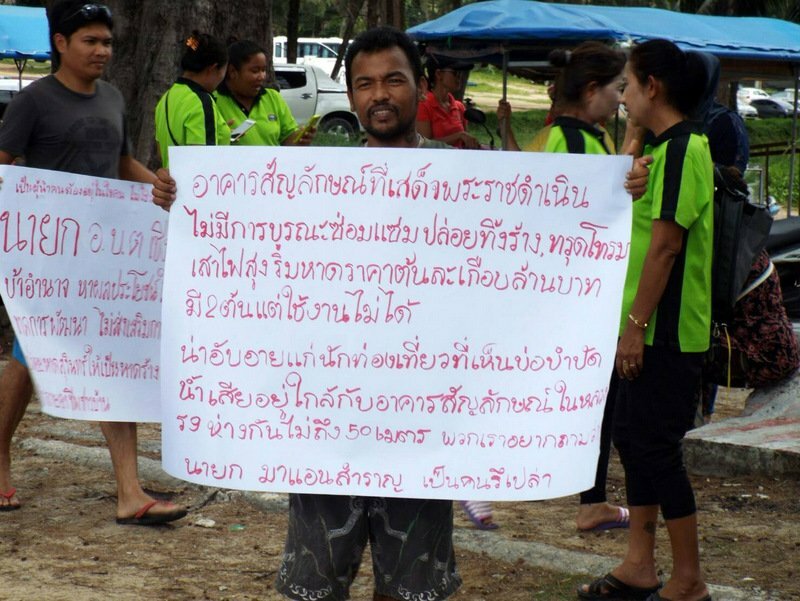 Clarify whether Surin football pitch belongs to a private entity or the public? How much budget is spent on this facility? 10. Are double standards applied between beach beds and umbrellas? 12. Who is responsible for the damaged road in Surin village? Mr Pradab presented the formal list of complaints and issues, but with Mr MaAnn not present the list was received by Somporn Onthong-in the Cherng Talay OrBorTor Chief Administrative Officer (Palad). Mayor.. for life, apparently. My dealings with this man, and the Cherng telay Or Bor Tor permit and health dept have left me nothing nice to say. Oh oh, How nice it would be to have a look into that Talay Orbor Tor financial bookkeeping and money coffers! In other countries the press is sometimes able to lay their hands on it. Are Governor and Provincial Hall officials allowed to look into it? And PN...please keep us informed of Ma-Ann's personal disastrous sea wall project. Actually, My family and I wish you would keep an eye on everything the Orbortor does, because we have yet to see anything that has benefited the local community...just poorly constructed projects...one after another...like tearing up the streets 3 or 4 times in the past year. Is it just the absence of by thai law set periodically local elections what make this Cherng Talay Orbor Tor chief can do or not do what he wants? What is this village chief contributing to this community? Seems more and more inhabitants feel things are not right. Is it not time the provincial officials start to lift butts from their hands and take action?